Attention: Environment Editor, Media Editor, News Editor, Science Editor, Government/Political Affairs Editor WINNIPEG, MANITOBA--(CCNMatthews - Oct. 7, 2005) - Manitoba's government has been graded on protected areas actions each year for 14 years. This year, despite 3 new small protected areas in southern Manitoba, the government receives a failing grade from Manitoba Wildlands. The annual protected areas grade is based on the government's commitments, its methods, data, and regulations, using the same criteria each year. (See technical assessment, bonus/penalty comments, MAP: www.manitobawildlands.org/ pa_grades.htm) Last year's protected areas grade was a 'C-'. This year's 'F' reflects lack of action on the part of the government in fulfilling its protected areas goals, and commitments. 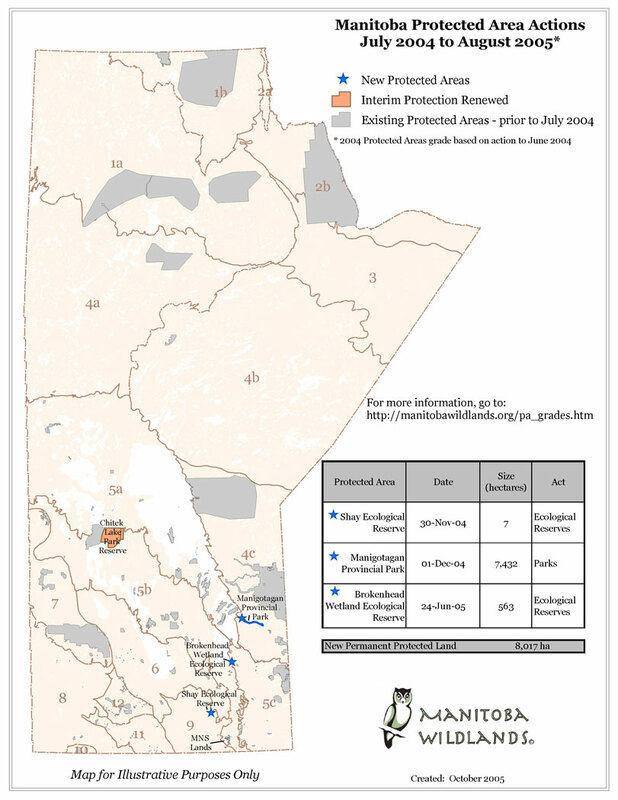 There are 100 areas of interest in the province waiting for review and protected status. Many are in Manitoba's boreal forest regions, including 10,000,000 acres reviewed and approved by the Minerals sector. No new protected areas were made in these regions. Various developments, many where the province is developer, are moving forward, and a new cycle of forest licenses is beginning, in regions with incomplete protected areas networks. Lack of concrete support for the World Heritage Site nominated by First Nations also affects the 2005 assessment. Despite World Conservation Congress support, and 55,000 letters urging interim protection be put in place to enable community planning, nothing has been done. Gaile Whelan Enns, Manitoba Wildlands director, indicated, "Our government is not keeping its protected areas commitments and ignores Manitobans' expectation to get the job done. We need protected areas in place before Hydro projects in our boreal forest regions. We also need to protect the carbon stored in our forests. It is time for the government to wake up and act!"